The Lab’s core activity is research to generate evidence on diets that can be used in lobbying and advocacy to policy makers to influence the food agenda at national level. The Fort Portal Food Lab has been successful in generation, sharing and reflecting of evidence with stakeholders including Media, parliamentary forum on food security and other food agencies to bring in new perspectives. Research on dietary diversity: The research uses the food diaries to record the food intake of households for a period of 7 days. So far the first phase of research was done and results were obtained and shared with stakeholders at the food summit and at the breakfast meeting with parliamentarians. The second phase of research is ongoing. Previously the household dairies were implemented in the rural hinterland of Kabarole District, however in this phase the dairies have been extended to the municipalities to track and compare the dietary diversity of both the rural and urban households in the District. We are eager to have the results which will be shared. Research on Value Addition: Survey results of KRC 2015 revealed most households exhibiting poor food consumption in terms of diversity and value. Among the factors explored as drivers of these poor diets was the limited traditional knowledge on food processing and value addition. It was noted that most people lack the knowledge of food processing and storage which in essence would ensure a constant supply of nutritious food and save time. Additionally a lot of food leaves the region unprocessed especially maize grain and returns in a processed form which is sold to the local people at five times the amount they sold the maize grain. A study on value addition was conducted in Zambia, South Africa, Tanzania and Uganda with an objective of exploring suitable value addition opportunities and innovations for Kabarole District and Uganda as whole. The Lab follows a bottom-up approach through partnership with local leadership, change agents, movements and initiatives such as the coalition of the willing for local advocacy on sustainable diets. The CoW-Agahikaine was born right after the Peoples’ Summit on Food with the overall intention to generate local voices of actors and players in the food system for local and national policy action. The Food Lab program at KRC has been able to consolidate and mentor this group of individuals into a strong body of individuals, organisations, and companies that can pursue critical issues of concern within the food change lab. It is anticipated the CoW-Agahikaine will be able to take on local level advocacy issues. The C.o.W is thus a local platform for information sharing, networking, lobby and advocacy by key food value chain actors. The 20 local actors form the Coalition of the Willing to advocate for sustainable food system in Kabarole, this is one of its kind in the District. The 20 actors are from various backgrounds such as farmers, small scale industries, Nogamu, street vendors, District councillors, local leaders and elders. The group was able to form a leadership structure and also develop an advocacy agenda with support from Hivos Kampala Office. The CoW is already working to influence diets in Kabarole District through their radio talk shows and exhibition on healthy diets. The Orugali concept is derived from the Tooro traditional eating system. It is a Tooro Traditional culture of sitting together around a meal and sharing from the same serving tray. It was discovered that there is a lot to learn about nutrition by sitting around a meal and eating together. Ideally, the Food Lab approach is demonstrated through the Orugali sitting arrangement. 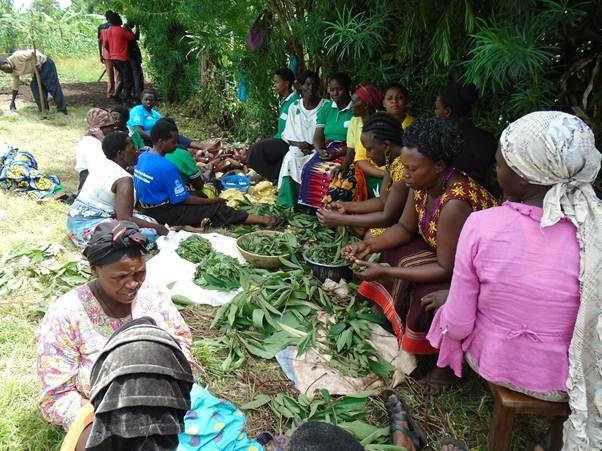 Through the facilitation and mobilization of KRC, a group of households were organized into a grass root consumer group known as Orugali group for advocacy on healthy diets. KRC has been mentoring the Orugali members into a more meaningful advocacy group for healthy diets. The Orugali households have been participating in the Food Change Lab evidence generation. Through the Food Lab, the Orugali food festivals have become a familiar activity whenever the group is meeting on a monthly basis. The Orugali delicious food is becoming popular on most occasions. Radio talk shows are ongoing and are being conducted by the C.o.W. The discussions centred on publicising the evidence previously generated on diets but also on the review of the Kabarole District Production ordinance. The Lab also utilises Drama series to dramatize the evidence generated. These are also aired on KRC FM. The Food Lab conducts annual food summits that convene local, national and international stakeholders on food systems. The first food summit was held in April 2016 in Fort Portal and was attended by over 150 stakeholders from Uganda and beyond. The summit was a success when different leaders and policy makes made commitments that were aired on KRC FM to change the food system. Nutrition education awareness was conducted in the rural schools and communities on healthy diets. KRC facilitators utilized visual materials and participatory approaches to present the aspects of good and poor nutrition. In one of the schools, the Head teacher pledged to invite KRC to make visual presentations about nutrition whenever there are PTA (Parents Teachers Association) meetings at the school in order for the parents to appreciate the value of good nutrition for their children. Participants also brainstormed on possible solutions that can be administered in their area to fight the rising malnutrition and child stunting. 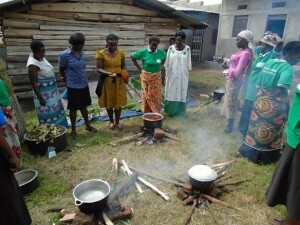 For practical knowledge transfer, KRC conducted cookery demonstrations to depict healthy preparation methods.